IT managers have the toughest management roles in a company and there are 7 reasons that make IT management so difficult. Gaining insight into these dynamics will position you to achieve more success. Well, yes it does to some extent but not to the same level it affects IT managers who must implement and support the technology. Paradigm shifts occur regularly in how we deliver technology services. IT managers are impacted far more than other managers due to the work associated in supporting technology change. What’s important with this one is the skills that help you succeed as a programmer or systems engineer (a technical expert) will not help you succeed as a manager. The success skills are very different. IT attracts people with certain work behavior tendencies just like sales attract people with a different set of personality traits. The problem is that our IT work behavior profile fits technical expert roles well, but it is not a great fit for management. A trait like poor communication isn’t such a handicap in a technical role but it prevents you from succeeding as a manager. The good news is that when you understand these dynamics, you can change your work behavior. 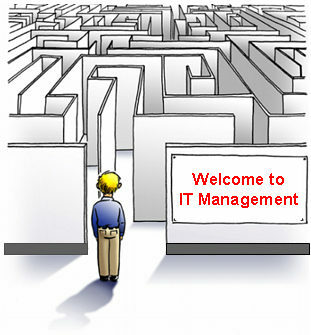 The bad news is that far too many IT managers are not aware so they struggle in management roles. Let’s say you were a very successful programmer for many years. Then, you are promoted to a Programming Manager position and you struggle. You were the best programmer. You understand software development inside and out. Your peers looked up to you and respected your programming skills. Past success was based upon what you did, not having to depend on others so much. In a manager role, success is based upon what your team accomplishes more than what you do. When you were promoted, the programming team lost productivity because the most productive resource was pulled out of the work pool. This can cause client satisfaction issues. Managing peers is difficult. The dynamics of your peer relationships change significantly and become more challenging the moment you become their manager. Managing people in any organization is difficult when you don’t have experience in it. Plus, there is a dynamic at play in the IT Organization making it more difficult for IT managers. In IT, the technical experts (your employees) usually know more about the technology than managers. Sales Managers know as much about selling as their Sales Reps. The CFO understands the financials and chart of accounts setup as well as anyone in the Accounting Department. Not true with the CIO. If he has business applications background, he may know very little about infrastructure and depends more on his employee’s knowledge than managers of other organizations must rely on theirs. IT is not the core competency of most companies. In banks, it’s banking services. In hospitals, it’s providing patient care. Technology is critical in delivering these services but technology is not their core competency. Let’s use a large grocery store chain of 300 stores as an example. If one of the grocery store managers is failing (poor financial performance, customer complaints, etc. ), there are 299 other successful managers who can conduct a store assessment and make recommendations to turn the failing store around. Grocery store management is the company’s core competency so there are many who can help. On the other hand, who helps a failing CIO? There isn’t anyone. The CEO doesn’t know how to fix IT problems because IT is not the company’s core competency. His solution is often to hire an outside consultant for help or replace the CIO. Many business needs and issues of non-IT departments require IT support to address them. The CIO is the only manager in the company who must understand the needs and issues of all departments in the company. If he doesn’t, his IT organization won’t be positioned to support them. This level of involvement with other departments isn’t required of non-IT managers, but it’s a huge issue for a CIO and his managers. This is possibly the biggest issue. Most of us in IT (over 70% from my research) are shy and introverted. As a result we don’t develop our communication skills. Technical experts are more interested in developing their technical skills; they don’t view communication as all that important. In a technical role, most communication is with other IT employees (our inner circle) about technical issues. When we become IT managers, the universe of who we need to communicate with expands dramatically. Communicating effectively is a critical skill that new IT managers must develop. I decided to use this inaugural post of the Practical Management Tips for IT Leaders blog to set the stage. IT managers have challenging responsibilities in environments that constantly change. In future posts I’ll explore all of these challenges and provide tips to help you address them successfully. This entry was posted in IT Manager Tips and tagged it manager, it manager challenge, it manager problems. Bookmark the permalink.